Five years ago, Toronto City Council banned all corporate and union contributions for municipal election campaigns. This was supposed to eliminate the influence of big money at City Hall, and give power back to you and me – the voters. What would you say if I told that the situation has gotten worse since then, instead of better? What if I told you that corporations are still funneling thousands of dollars into election campaigns, but in a way that is harder to track and less accountable? Read on. 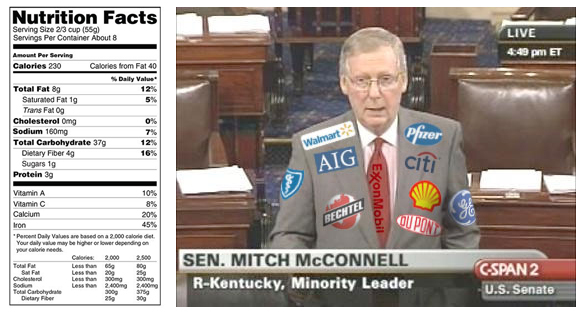 Every day, corporate lobbyists roam the corridors of City Hall trying to influence the outcome of government decisions. They’re paid generously for their work, and they’re good at it. We have three important mechanisms in place to minimise the influence of theses lobbyists and to ensure that politicians remain accountable to the voters. But these mechanisms are all failing us – because no one is connecting the dots between them. 1) The lobbyist registry. This program was created under former mayor David Miller. It’s a good program. 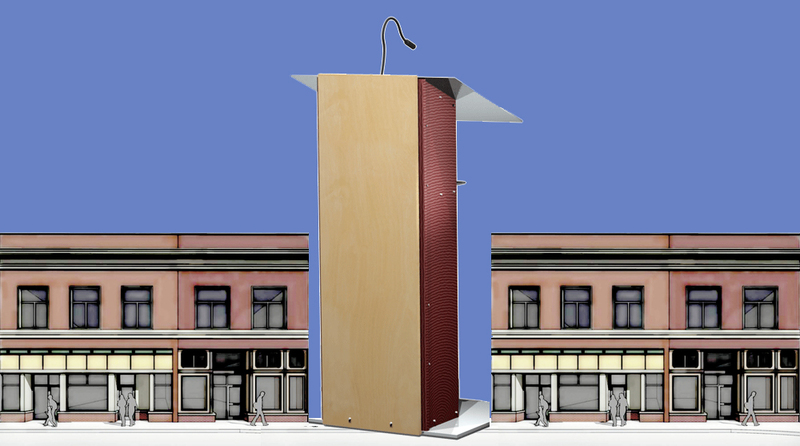 It requires that each and every meeting or communication between a lobbyist and Councillor must be publicly declared. That way, we know who is trying to influence whom. 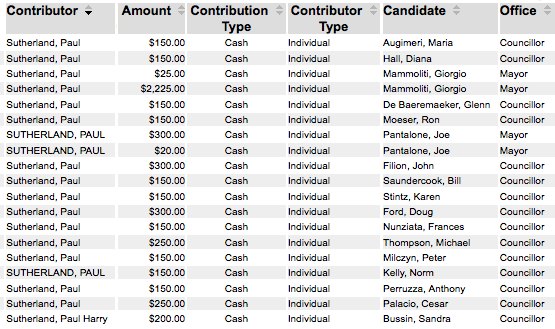 2) Election contributions. We all know that money can corrupt the decision-making process. That’s why all candidates running for City Council must publicly declare the source of all of their campaign contributions. So – no problem, right? 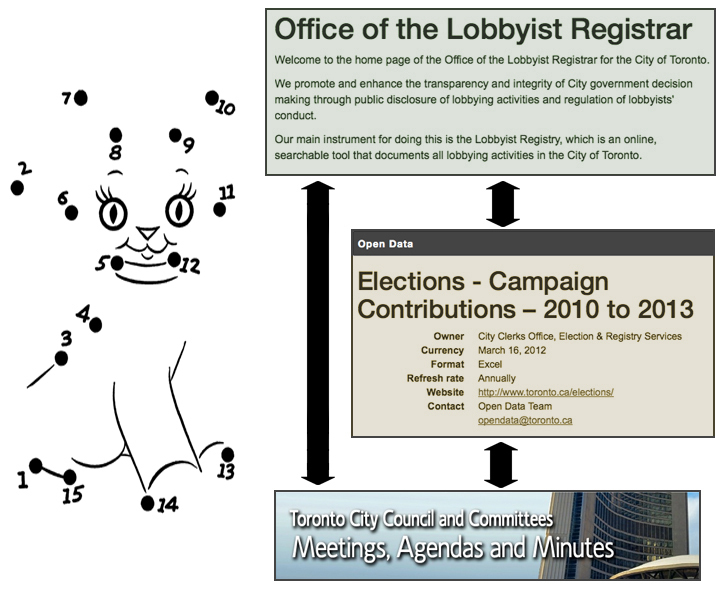 We’ve got the lobbyist registry, a list of all election contributions, and a record of every vote at City Hall. All the bases are covered. Our Councillors’ work is transparent and accountable. Except for one problem: No one is looking at most of this data. More importantly, no one is looking for patterns that may exist between these three data sets. Or, in other words, no one is connecting the dots. 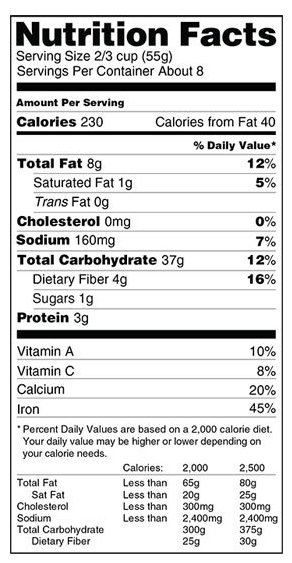 a) The amount of each nutrient contained in the package. b) The Recommended Daily Intake (RDI) for each nutrient. This is good data to have, but what makes it really effective and practical is that Health Canada forces all food manufacturers to cross-reference all three pieces of data, on one simple label. And although the Lobbyist Registry and the mandatory food labeling legislation were both introduced in the same year (2007), it’s interesting to note how differently they dictate the rules and formats for disclosure. Imagine if the food labeling operated the same way as our mechanisms at City Hall. You want to buy a box of cereal, and you have to check three websites to find out the nutrition value. One website tells you how much calcium is in the whole box, another website tells you how much calcium you need each day, and a third website tells you how many bowls of cereal are in each box. Prediction: No one would look at any of the websites, and it would be as if the data didn’t exist. Last year, a company called Allvision teamed up with Metrolinx to apply for permission to install eight massive digital billboards on highways 401 and 427. These billboards break every rule in the book: they’re too big, too bright, and are extremely dangerous for drivers (since they are literally designed with the sole purpose of distracting drivers’ attention away from the road. It’s insane). City staff recommended against the signs (of course). The citizen Sign Advisory Committee rejected the signs too. City Councillors were presented with all the facts about safety, about neighbourhood impact, about the lack of community consultation, incorrect information used in the application…. but they voted in favour of the signs anyway. And that was it. The media pretty much ignored the whole thing. No one knew it happened. So – how DID it happen? Why did Councillors ignore the data, ignore science, and ignore the proper democratic process? Well, if you look at the lobbyist registry, you’ll find some clues. Let’s just take two of the registered lobbyists, and see how many meetings they had about the Metrolinx billboards. 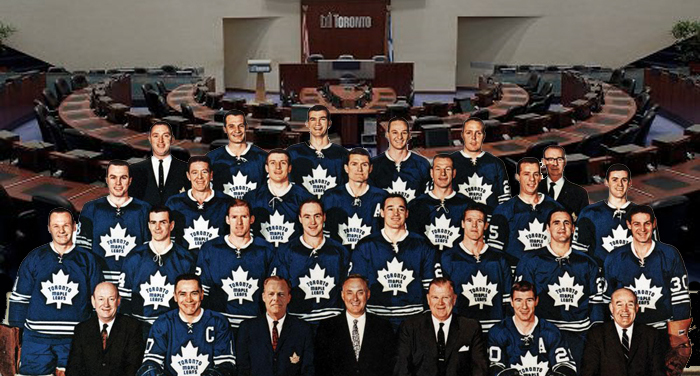 Paul Ainslie (twice), Michelle Berardinetti (twice), Shelley Carroll, Josh Colle, Gary Crawford, Frank Di Giorgio (four times), Doug Ford (five times), Mark Grimes, Norman Kelly (twice), Giorgio Mammoliti (twice), Peter Milczyn (four times), Denzil Minnan-Wong (twice), Frances Nunziata (twice), David Shiner, Karen Stintz, Amin Massoudi (Doug Ford’s Executive Assistant), Earl Provost (Mayor’s Chief of Staff – five times), Mike Makrigiorgos (Cesar Palacio’s Executive Assistant), Paul Saracino (political staffer) , Sheila Paxton (political staffer), Deputy City Manager (twice), and the Manager of the city’s Sign Unit. Woah. Can you imagine how much $$ that costs? There are literally HUNDREDS of meetings happening here, all on ONE SINGLE ISSUE. Allvision and Metrolinx are trying as hard as they can to influence the process with paid lobbyists meeting repeatedly with Councillors and senior staff. And that’s just the contributions from the 2010 election. There are many, many more from the 2014 election. And some of those recent contributions were being made at the exact same time that the Councillors were voting. Think about this: A lobbyist can meet with a Councillor on a profitable issue, give that Councillor hundreds of dollars – the SAME WEEK – and then sit in the Council Chamber and watch the Councillor vote, one or two weeks later. There are no rules in place to prevent any of this. This is how decisions are being made at City Hall. And we’re mostly blind to it. 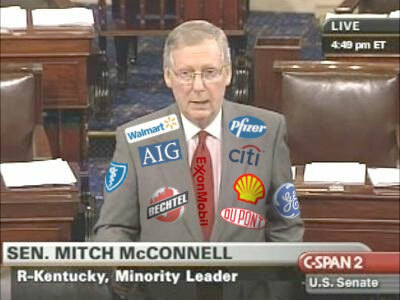 Some political activists have called for NASCAR-style uniforms for politicians, showing who all their “sponsors” are. This would be funny and indeed useful for voters… but isn’t really a practical solution. The practical approach is simple: a single website that aggregates all three data sets at City Hall, and produces charts and graphs automatically, for each Councillor, each lobbyist, and each vote, all cross-referenced and interactive. Better yet, the two pre-vote data sets (lobbyist visits and financial contributions) should already be posted online, cross-referenced, BEFORE each vote. There could be a live-feed of each Council meeting, with charts being automatically produced before each vote. How many Councillors were lobbied on this issue, how much money was spent, and who received that money? This would be an amazing tool for citizens (and media), but could also perhaps have an impact on how politicians behave. After all, the mandatory food labels don’t just inform shoppers, they also act as an incentive for food manufacturers to make healthier food. Knowing that the calorie count and sugar quantity is going to be prominently displayed, forces the companies to reduce the amount of sugar and calories in their food. So perhaps politicians would behave differently as well, knowing that their meetings with lobbyists, and the dollars they have accepted directly from those lobbyists, was all publicly displayed clearly – before each vote. Matt Elliot has done some great work with his City Council Scorecard. The Toronto Star had an amazing project called “Lobby Watch”, but the project is not active. David Hulchanski’s Three Cities report was a powerful eye-opener for everyone. 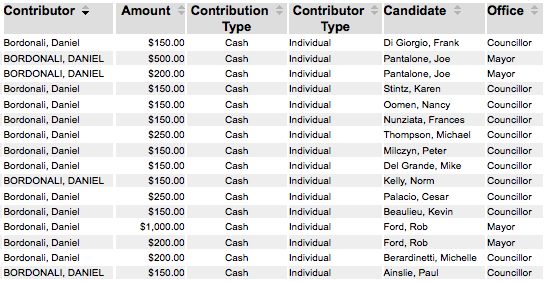 A group called VoteToronto used to do amazing work around campaign contributions, but is not active right now. Joel Eastwood has produced stunning data visualisations for the Star, Globe and CBC. So we know how to play with data in Toronto. I’m hoping to pull a team together to look at this issue, and to try to create some new tools for citizens and media to use! The movement for Open Data has been very successful at getting raw information available. And the creation of the Lobbyist Registry and the banning of corporate election contributions were important steps. But it’s time to connect the dots, and put all of this data to work! If you think this is important, please share this post. And if you want to get involved – please let me know! This week marks the National Day of Remembrance for Road Crash Victims. Every single day Canadians of all ages die on our roads. Surprisingly, the leading cause of fatal collisions is not speed nor alcohol. The #1 cause of death on our streets is driver distraction. Posted in Community Organising, I Have Too Much Time on my Hands, Random Rants, Uncategorized, Whose Space is Public Space? UPDATE (June 2013) • Sometimes you just have know when to walk away. Despite the positive update I posted in April (below), the situation at Fair Vote has gotten worse and I’ve decided to quit the organisation after seven years of volunteering. I’m working with an amazing team of people to start a new national campaign for proportional government, called Unlock Democracy. • The only group that actively campaigned against the RaBIT campaign, was Fair Vote Canada. I’ve never seen a movement so committed to shooting itself in the foot, and attacking its own peers. • The Toronto Chapter Executive didn’t hold a single meeting for an entire year. Then they organised a rigged election for the 2013 Executive, by rejecting all the candidates they didn’t like. • A recent meeting of the National Council ended with two young female members in tears, after being verbally attacked by a male colleague. Sadly, this type of bullying and harassment has been happening for years. • I reached out to one of the key members of the National Council, and offered to sit down over lunch or coffee to discuss the situation. The offer was repeatedly turned down. If people aren’t prepared to talk, then there is little possibility to build consensus. For these reasons – and hundreds more – I’m done. I wish Fair Vote the best of luck. There are some really good people working there, including the Executive Director Wayne Smith and the current President Doug Bailie. But you gotta know when to fold ’em. And I’m folding. The movement is big enough for two groups, and hopefully we can all work together at some point. UPDATE (April 2013) • Good news, in regards to this story. The National Council of Fair Vote Canada has voted to reinstate Desmond Cole and Katherine Skene on the Toronto Chapter Executive. Also, they have accepted the nominations (previously rejected) for National Council, for Sarah Lambert, Gautam Lamba, and others. There is also now a comprehensive agreement in place that allows both RaBIT and Fair Vote to work collaboratively. I want to personally thank Jim Harris who has been working tirelessly to forge a consensus and encourage a healthy dialogue and required compromise on all sides. He is truly a master of mediation. As someone who is a committed volunteer for both RaBIT and Fair Vote, I’m thrilled to see everyone on the same page. Thanks Jim, and also thanks to our Executive Director, Wayne Smith. And thanks to all members of National Council who supported this positive step forward. 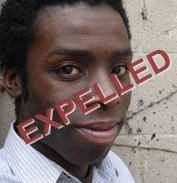 A couple of weeks ago, three members of Fair Vote Canada were expelled from their elected positions on the Toronto Chapter Executive (myself, Desmond Cole and Katherine Skene). 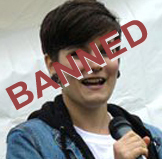 One week later, three members were told that their nominations for the Fair Vote National Council had been rejected (Sarah Lambert, Gautam Lamba and Katherine) – simply because they had volunteered with an external group. I’ve been involved with community organising for 15 years. I’ve volunteered for dozens of groups in Toronto, I’ve been employed by about 15 non-profits, I’ve served as a Director on boards such as the Mayworks Arts Festival, and I’ve been a member of two political parties. I’ve seen my share of conflict. But in all that time, I can say that I’ve never experienced this kind of exclusionary, top-down, anti-democratic behaviour. It’s stunning, and the worst part is that it’s happening within an organisation called “Fair Vote”. 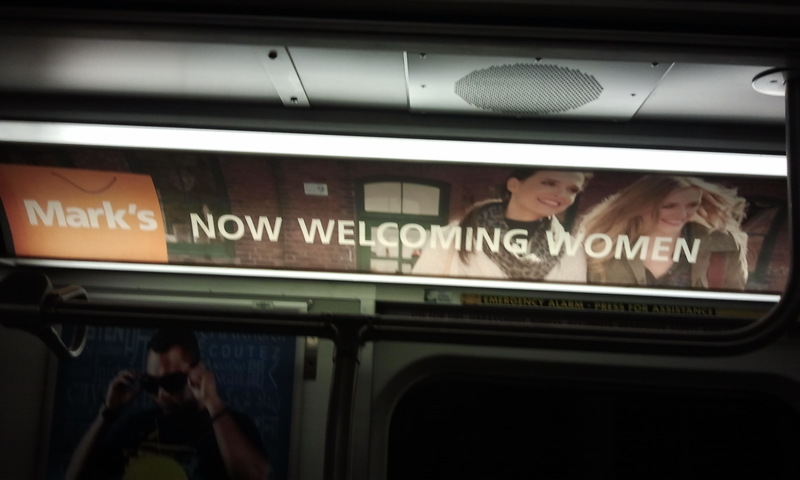 But, since that blog post, things have changed at City Hall. As of this month, there will now be one female Committee Chair at City Hall. Jaye Robinson has been appointed chair of the Community Development and Recreation Committee, bringing the number of female Chairs on the Executive Committee up from 0% to 14%. In 2010, forty Torontonians ran for mayor. The media selected six candidates as frontrunners, and only one of them was a woman. By election day, Sarah Thomson had dropped out of the race, along with Rocco Rossi and Giorgio Mammoliti. The remaining frontrunners were all men. Sadly, this isn’t surprising in a political world where the last three leaders of our three levels of governments have the following names: Stephen, Paul, Jean, Dalton, Ernie, Mike, Rob, David & Mel.